It's finally here! New Star Wars: The Force Awakens footage! And it's epic. We not only get to see Rey and BB-8 in a few seconds of never-before-seen footage, we also get to see the film's epic lightsaber duel teased. 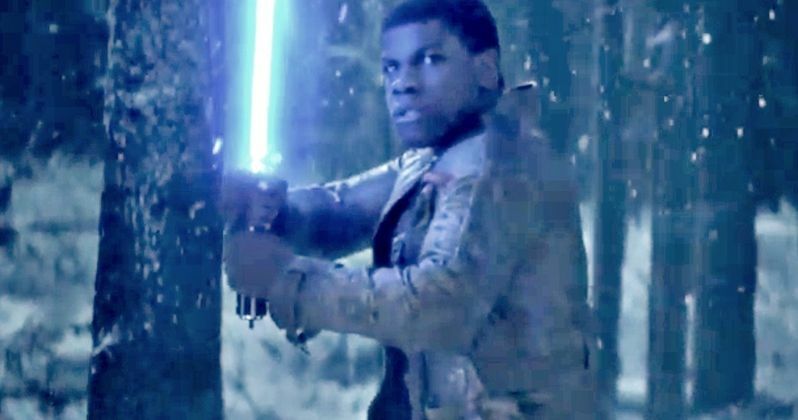 Yes, Finn will be going up against Kylo Ren, using Luke Skywalker's original blue lightsaber. The fight is only hinted at, but it will surely be one of this sequel's most talked about moments. It's only a few seconds long, but well worth the wait. Today, Instagram announced that - in addition to square posts - you can now share photos and videos in both portrait and landscape orientation on their platform. With this update, Instagram users can upload widescreen video which will be more cinematic than ever. This morning, @StarWars released an exclusive look at their upcoming film, Star Wars: The Force Awakens, using Instagram's new landscape orientation. As part of this collaboration, Star Wars: The Force Awakens is the very first video content to be showcased in this new format for the Instagram community. The video has brand new footage featuring Finn (John Boyega) wielding a light saber, squaring off with the villainous Kylo Ren (Adam Driver). The footage also gives us another look at Rey (Daisy Ridley) and her ball droid BB-8, along with another look at a massive assembly of First Order Stormtroopers. Now that Star Wars has debuted new footage through their Instagram account, hopefully today's video will be the first of many to come, before Star Wars: The Force Awakens hits theaters on December 18. The story is set more than 30 years after the events of Star Wars: Episode VI - Return of the Jedi. Lucasfilm and visionary director J.J. Abrams join forces to take you back again to a galaxy far, far away as Star Wars returns to the big screen with Star Wars: The Force Awakens. The film stars Harrison Ford, Mark Hamill, Carrie Fisher, Adam Driver, Daisy Ridley, John Boyega, Oscar Isaac, Lupita Nyong'o, Andy Serkis, Domhnall Gleeson, Anthony Daniels, Peter Mayhew and Max von Sydow. Kathleen Kennedy, J.J. Abrams and Bryan Burk are producing with Tommy Harper and Jason D. McGatlin serving as executive producers. The screenplay is by J.J. Abrams & Lawrence Kasdan. This footage also features the narration of Andy Serkis, who was confirmed earlier this year to be playing a character named Supreme Leader Snoke. We still haven't seen what he will look like on screen quite yet, but perhaps we'll get to see our first look at this evil character in the next trailer, which will debut sometime this fall. Unfortunately, we don't have an exact date for when the third trailer will arrive, but we'll keep you posted as soon as more updates come in. While we wait for the next full-length trailer, check out this brief video with new Star Wars: The Force Awakens footage below. We got our first look at Finn wielding a light saber in the Drew Struzan poster that debuted at D23, but this teaser gives us our first look at Finn preparing for battle. What do you think of Finn wielding a light saber?